It is easy to see why Massachusetts art teacher Christina Chang thinks standardized testing "is not working for the kids." When Chang, a veteran Burlington High School teacher of 12 years, asked her students to create art based on their feelings about standardized testing, the students' works came back with one common thread: stress. "The common theme was they didn’t like it, it was stressful, there may be better ways to do this," said Chang, who recently posted pictures of the artwork on her blog. 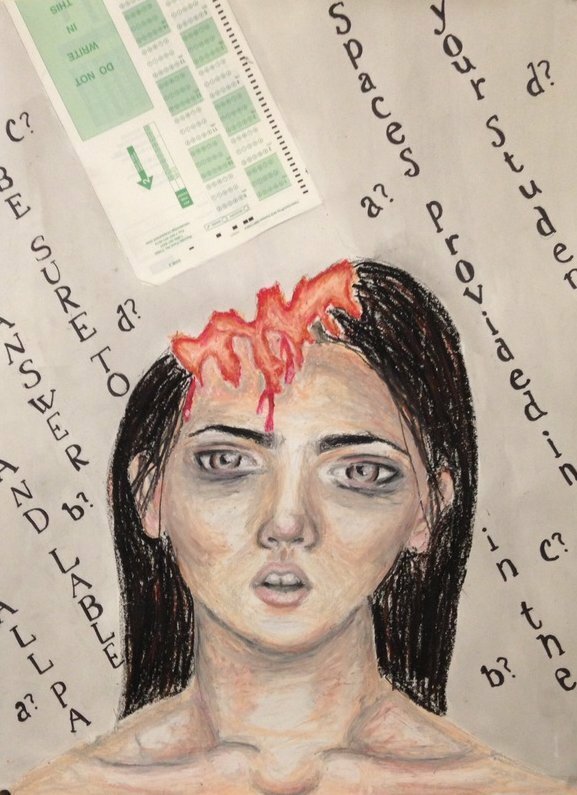 Student Josephine Samarjian's piece of art about standardized testing. Chang's students, a mix of 10th-, 11th- and 12th-graders, got the assignment in March, right after sophomores took MCAS tests. The MCAS, or Massachusetts Comprehensive Assessment System tests, are a set of statewide math and English exams that students are expected to pass to graduate. Chang's students returned to art class after a week of testing with "a lot of feelings" about high-stakes exams, Chang said, and the first thing she thought was "they need to express this with art." She asked her students to write down how they felt physically and emotionally before and after taking the exams and then create a piece of art reflecting those feelings. She offered them materials like old Scantron sheets -- scoring sheets sometimes used in multiple-choice tests -- to use for their pieces. 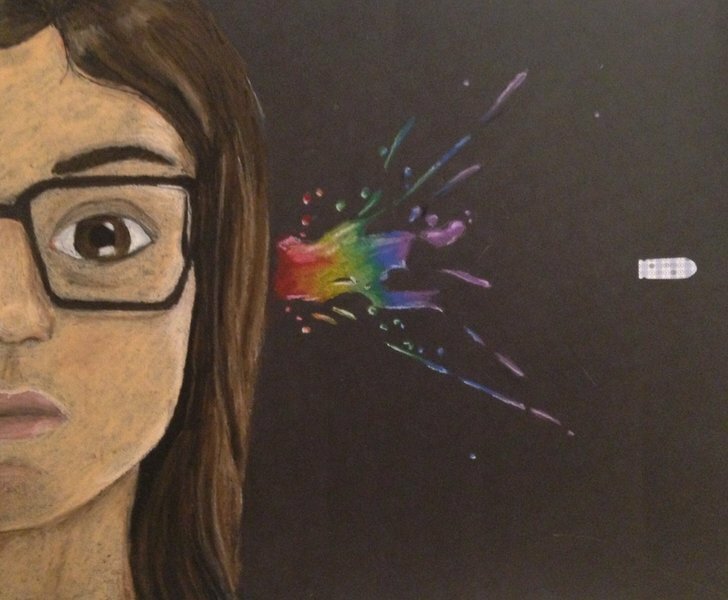 Sophomore Rachel Carlino created a piece with words like "ugly," "nervous" and "failure." "I don’t think it helps with what we’re learning and it causes kids a lot of stress and panic," Carlino told The Huffington Post, speaking about standardized tests. Student Alyssa Healey's piece of art about standardized testing. Growing up in the No Child Left Behind era, Carlino is used to the annual stresses of standardized testing. "I think it's always kind of been the same," she said. "Even when you were little you would freak out because it was an MCAS day." The No Child Left Behind Act, passed in 2001, mandates that states test students on math and reading every year in grades three through eight and once during grades 10 through 12. Proponents of high-stakes testing say these tests hold schools accountable for their students' scores, allow parents to get a sense of how their kids are performing and reveal achievement gaps between groups of students. Chang thinks "the stress [standardized tests] put on my students is interfering with their overall learning," although she did not tell her students her personal opinions on the topic when giving this assignment, she said. Below are some of the pieces of art Chang's students created.